Immigration, immigrants and refugees are a popular topic around the world these days. It is a topic with wide-ranging points of view and comments are often loaded with emotion. In the book, Representing the Other in European Media Discourse, Dr. Liisi Laineste, Senior Researcher, Estonian Library Museum, Tartu University contributes Chapter 12, “Othering in Estonian Online Discussions about Refugees.” The chapter is the result of an analysis of the 2015 refugee crisis in Europe in anonymous and non-anonymous Estonian public forums. The comments that were studied were the focused on a local incident, the setting of a fire at a refugee centre in Vao in north-eastern Estonia in September of 2015. The study draws conclusions from the news readers’ comments to describe how online forums communicate conflicting emotions and opinions about the Other. As in many other countries immigration is a hot button issue in Estonian. Dr. Laineste’s study, addresses emotional, discriminating othering of refugees in online comments that emerged around the public discussion of setting fire to the centre for asylum seekers in Vao, Estonia. I will show how the Other is placed in the middle of a battlefield of opinions where emotions clash and viewpoints become even more polarized as a result. I approach my material as a scholar of digital folklore, combining quantitative and qualitative methods, ranging from statistics-based topic modelling and thematic analysis to a diachronic analysis of recurring folkloric motifs and myths. Dr. Laineste used QDA Miner to code 2742 comments from a local site to decide the tonality/emotions of the comments. The categorisation system included two major parameters (target / object of the comment, emotional tonality) and was compiled with a cumulative method, updating the system in accordance with the material. 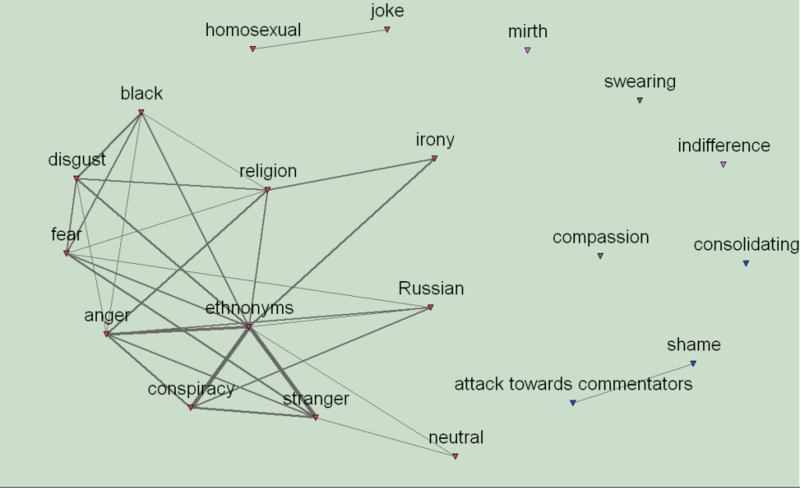 The study also used the software’s co-occurrence analyse feature, to pinpoint the prevailing types of sentiments. The study identified five principal types of sentiment: anger, fear, shame, disgust and compassion. The study’s conclusions discuss the effect of the Internet, the emotional impact of the refugee question, Othering and how online communication contributes to the spread and melding of ideas.